CYBERWAR Driver Training Simulators provide your soldiers with the skills, experience and confidence they require to safely and effectively complete their missions. CYBERWAR Driver Training Simulators represent the very latest in virtual, interactive training technology. The culmination of two decades’ experience, developing advanced training simulators for the military, mining and commercial sectors. CYBERWAR Driver Training Simulators are the perfect solution for militaries looking to cost-effectively train large numbers of personnel on a wide range of vehicles and systems.  Rising fuel costs, wear and tear of expensive equipment and the pressing demands of high operational tempos are just a few reasons why driver training, using traditional methods, is often neglected. CYBERWAR Driver Training Simulators address these issues directly, allowing militaries to cheaply and effectively increase driver proficiency, improve driver safety and reduce fleet operating and maintenance costs. CYBERWAR Driver Training Simulators cater for almost every type of vehicle and driving application, from cars and LDV’s to trucks, buses and specialised military vehicles such as ICV’s and MBT’s. CYBERWAR Driver Training Simulators also support the training of all levels of student. Whether you are screening and instructing first-time drivers, maintaining the skills of qualified personnel or providing orientation and acclimatisation training to troops prior to deployment, there is a training programme to match your needs. 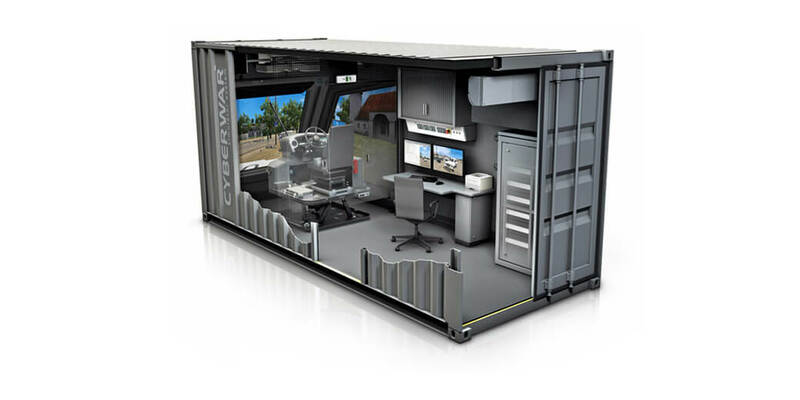 Designed with the rigours of remote, operational training in mind, the Containerised CYBERWAR Driver Training Simulator is built to go where your soldiers go. It is robust, self-contained, and highly deployable. 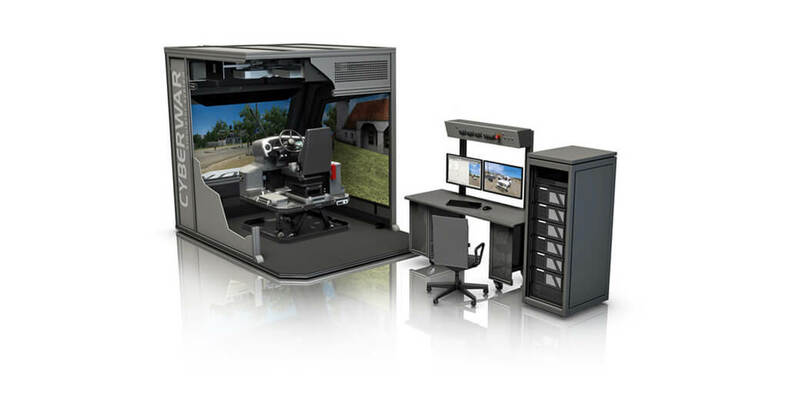 Built into a ruggedised, 6m ISO container, this CYBERWAR Driver Training Simulator has a very small logistical footprint, is extremely transportable and delivers the full spectrum of modular, high-fidelity driver training and evaluation. Utilising the same proven, reliable technology as the Containerised Variant, The Fixed-Facility CYBERWAR Driver Training Simulator is intended to be housed within pre-existing, dedicated training facilities. 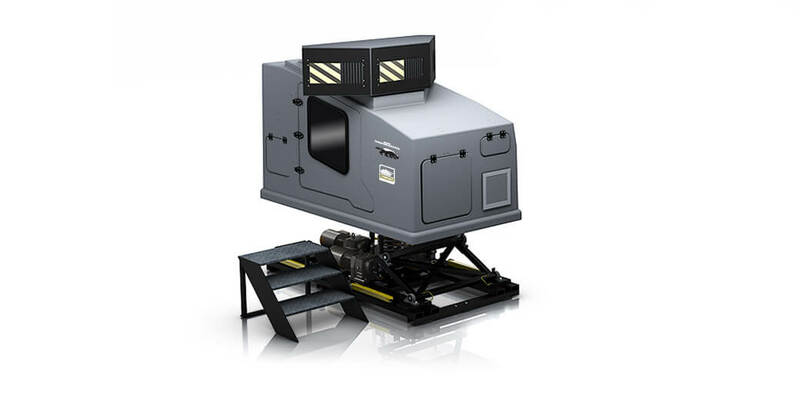 It is ideal for large, networked deployments where training capacity is the primary concern and the full benefits of interactive, multi-simulator training can be realised. Flexible in design, flexible in budget, flexible in every way. The Customised CYBERWAR Variant gives you the power to have a simulator system designed for you to perfectly match your unique training requirements. Define your preferred configuration, either free-standing or containerised, to suit your application. Select a level of physical, system fidelity and decide between a static or motion-based solution with either three or six degree of freedom motion platforms available for the ultimate in simulated driving experience. Customise your visual system and even your software to ensure that you end up with a driver training solution that perfectly matches your needs and your budget! The 3D virtual world in which the learner driver will operate is a vitally important component of the driver training system. 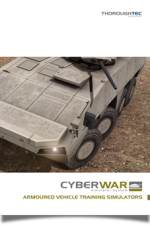 CYBERWAR Virtual Driver Training Worlds are modelled on real-world terrain and road networks, and include everything from icy roads and desert sand to the most complex urban environments. These photo-realistic 3D environments are carefully constructed to include all relevant terrain features and road types, from dirt tracks with high-gradient slopes, soft sand, rocky outcrops, swamps and river fords to highly congested city streets and sweeping highways, for every conceivable driving scenario. Territory-specific traffic control features and signage are accurately placed and the environment is richly populated with Artificially Intelligent vehicles and pedestrians. To further immerse the learner in the driving experience, seasons, time of day, weather and visibility are all modelled in exquisite detail so as to ensure that every conceivable training scenario is catered for and the effect of environmental conditions on vehicle performance and handling, fully realised. If required, CYBERWAR Virtual Driver Training Worlds can be customised to meet your unique specifications such as geo-specific areas, for pre-deployment orientation and acclimatisation or military driving areas and obstacle courses. Naturally, territory specific rules and regulations or special operational procedures and tactical considerations can be included. Whatever it takes to provide your trainee drivers with the most realistic and effective training experience possible. 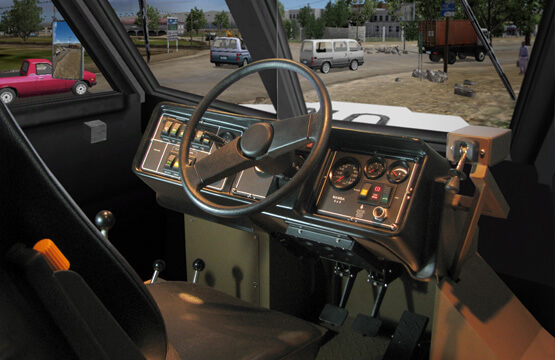 CYBERWAR Driver Training Simulators are populated with AI pedestrians and vehicles, allowing the learner driver to interact with the virtual environment in a realistic and challenging manner. This AI traffic system is fully controllable via the instructor interface and can be scaled to increase or decrease the intensity and thus difficulty of training scenarios. Like real-world, human traffic, the AI governing the behaviour of vehicles and pedestrians is personality driven and goal based. Furthermore, it is sensitive to both time of day and weather conditions, intuitively adapting its behaviour to suit ambient conditions as well as reacting to the actions of the learner driver. Through in-depth research, high-fidelity engineering and advanced mathematical modelling, CYBERWAR Driver Training Simulators accurately replicate the type of vehicle being simulated. From the engine and drivetrain through the suspension system and tyres, every attribute and performance characteristic of each simulated vehicle class is accounted for. Whether you’re teaching people how to drive cars, buses, trucks or even specialised armoured vehicles, CYBERWAR Driver Training Simulators have a solution to meet your needs. Whether training to drive a high centre of mass APC, off-road in Africa or negotiate a bustling downtown market in an MBT, CYBERWAR Driver Training Simulator’s high-fidelity vehicle modelling ensures that the training experience is both believable and directly transferable to real-world application. The vehicle’s weight, centre of mass, aerodynamic properties, complete drivetrain, suspension system, brake system and tyres are all mathematically modelled from first principles. In this way, their real-time interactions and dependencies are properly simulated to provide unmatched realism and the most immersive simulated driving experience possible. An Active Force Feedback Steering system enhances the simulated driving experience by delivering realistic tactile feedback to the learner driver’s steering wheel. Through the steering wheel, the learner driver will feel the torque of the vehicle, the response of the tyres on varying terrain and at different speeds and nuances of under- or oversteer based on vehicle type. CYBERWAR Driver Training Simulators are upgradeable to include dynamic, full-cabin motion feedback. This is provided through the optional attachment of either a three or six-degree of freedom motion platform for an unprecedented level of feedback and immersion, providing the learner driver with the full-body motion cues, typically associated with acceleration, braking, cornering and other road conditions. CYBERWAR Driver Training Simulator exercises may be configured to cater for every conceivable training scenarios, with programmable variables including location, vehicle configurations, weather conditions, time of day, subsystem failures and advanced emergency situations. Each and every aspect of the driver’s vehicle operation are continuously monitored and automatically evaluated by the CYBERWAR Driver Training Simulator, to construct a detailed driver profile and performance report at the end of each exercise. The instructor is also provided with a powerful After-Action Review facility, which records every aspect of the exercise for fully dynamic 3D replay, student debriefing and analysis.